Give the gift that keeps on giving - an ideal Christmas, Birthday, Anniversary or special occasion gift that will last longer than cut flowers! A versatile house plant that will fit in with every colour and style effortlessy, breathing life into indoor spaces. Will flower for 6-7 weeks on receipt and with a little care, will flower again in the future. Produces beautiful pink classic 'moth orchid' flowers and is supplied as a high quality grade plant with 2 stems for extra flora! 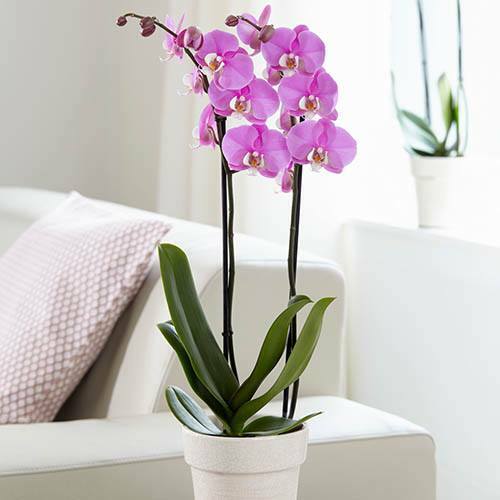 Everyone loves a 'Moth orchid' - whether old-fashioned or modern and trendy, they fit in with every colour and style effortlessly. This versatility makes them the perfect Christmas Plant Gift, as the lucky recipient will not only get 6-7 weeks of flower enjoyment (way more than a bouquet), and with little care will flower again in future as well. The Orchid will be pale to darker pink, with plenty of buds remaining, and be the higher quality grade with 2 stems of flowers, and come in a colour coordinated cachepot, so it can be unpacked and displayed straight away. Send as a Gift and write a personal messaghe at the checkout. Supplied as a potted plant, in flower and bud, with 2 stems. protect from frost on receipt.